Forty-three intrepid volunteers braved the cold morning air on January 14 to look for bald eagles in The Last Green Valley during the annual Midwinter Eagle Survey. 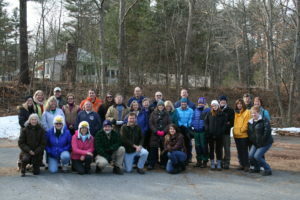 The Last Green Valley, Inc. (TLGV) has organized volunteer teams since 2010, and this year, volunteers scouted 29 different locations including 22 locations on the Quinebaug, Shetucket, Willimantic and Natchaug Rivers and 7 locations on lakes and ponds. Volunteers sighted 12 bald eagles, with 6 sighted on rivers and 6 on lakes. Most of the eagles arrived in the region during the past month or two from northern states where the cold weather has frozen over rivers and lakes. Bald eagles are primarily fish eaters, though they have been reported to eat ducks and other prey as well as carrion. They are here because the habitat can support them with excellent food sources, and because most of our rivers don’t freeze completely during the winter months. This year’s count was lower than previous years and was most likely due to the warmer weather at the time of the count and open water on lakes and ponds that dispersed the eagles throughout the region. The warmer weather in northern New England may also have kept the eagles in their home range longer than in previous years. Some of the eagles that were sighted are “native.” The Last Green Valley National Heritage Corridor is home to an ever-increasing population of year-round resident bald eagles. . We know of 6 successful bald eagle nesting pairs that have raised and fledged eaglets in the Corridor over the last several years. The CT Department of Energy and Environmental Protection will crunch all of the information gathered by volunteers to determine the number of individual birds in the area. The detailed data reported by volunteers, such as exact time, location, and movement patterns are all vital pieces of the puzzle. Nationally, the program is a project of the U.S. Geological Survey, Biological Resources Division. Teams across the country observe on the same date and during the same hours to make the Midwinter Eagle Survey a national, state and regional snapshot of the health of the eagle population. Some states, such as Massachusetts, do not participate in the Midwinter Eagle Survey but conduct their own nest surveys in the spring. The Last Green Valley National Heritage Corridor is the last stretch of dark night sky in the coastal sprawl between Boston and Washington, D.C. The Last Green Valley, Inc. works for you in the National Heritage Corridor. We help you to care for it, enjoy it and pass it on!